I was fortunate to attend one of my favorite travel events of the year last weekend: Chicago Seminars. If you’re not familiar with it, it is one of many conferences around the world (or “DOs“) where travel enthusiasts from experts to rookies gather to share stories, tips, tricks and ideas. Furthermore, it raises thousands of dollars for great charities such as: ASPCA, Habitat for Humanity, The Wounded Warrior Project. In addition to absorbing “earn and burn” content and meeting old friends and new, I was particularly interested in bending some people’s ear about our upcoming trip to Thailand. My travel philosophy is simple: meet diverse people, see amazing places and travel with purpose. 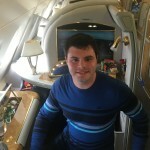 So in my opinion, while flying in business class, lie-flat seats and enjoying upgraded suite accommodations makes any trip more enjoyable, you must literally step out into a community to experience it. Walk its streets. Taste its foods. Start up conversations. Go where the locals go. AND do your part to leave some positive impression. Kirimas School is a small governmental primary school near the resort with 80 students and teachers. Samui Learning Centre of Special Needs is a non-profit organization in Koh Samui that caters to the learning and development needs of autistic children and their parents. And Conrad Koh Samui was not the only Thailand Hilton property taking part in Hilton’s Second Annual Global Week of Service (See the Project Map!). In celebration of Hilton Worldwide’s second annual Global Week of Service, October 6 – 12, almost 700 volunteers across different departments in Hilton Worldwide in Thailand served and collaborated with 10 community partners in Bangkok, Pattaya, Hua Hin, Phuket and Koh Samui. These community partners comprise not-for-profit organizations, foundations and schools. All nine Hilton Worldwide properties in Thailand participated in Global Week of Service. Almost 700 volunteers across Hilton in Thailand helped this year’s second annual Hilton Global Week of Service. So, you’ve learned how to use multiple credit card sign-ups to earn travel points to amazing new destinations and four-star hotels. Your family and friends are baffled by your six figure (or seven figure!) mileage and points balances, putting you at the symbolic “front of the line” for travel. I love it! I’m hooked too! Nevertheless, while you enjoy your time in that private plunge pool and toast with Cuvee Dom in first-class, remember to step out. Step out into their community. Step out to hear from the locals, share your thoughts, learn their issues. And if you can, make some impact. From volunteering to delivering a care package to acknowledging and thanking others for their work, remember to always travel with purpose. PreviousUp to $50 FREE uberX Rides in DC Through Friday… And More!